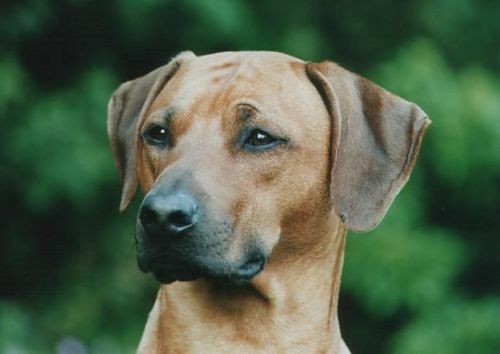 Rosko was bred by Sue Campbell and Charlie Wheeler of Nyassa Rhodesian Ridgebacks. He is a very handsome boy and was to be our first show dog - lets be honest here, it was Jean doing all the hard work, training, showing etc. but it didn't stop me knowing all of the answers when things went wrong! Sound familiar? He won a few classes at open show level, once taking third place in puppy group, and was placed in his class at Crufts 2001. However, his forte was obedience, passing The Bronze Test of The Kennel Club Good Citizen Dog Scheme at less than eighteen months of age. He has also done some rudimentary scenting work, which he enjoys and is something we may build upon in the future. He is very affectionate and likes nothing better than to curl up by your side, save perhaps running through the woods chasing his great friend Lotti, our next addition! 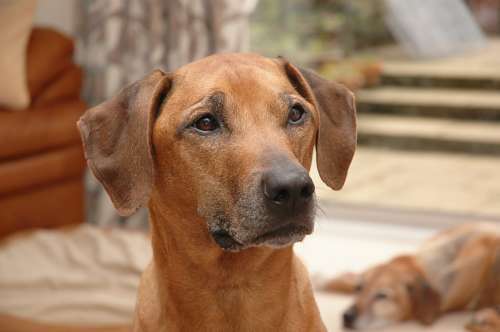 Sadly we lost our lovely boy in August 2009 after a short but devastating illness. What secrets from the Dark Continent of his ancestry were hidden behind those limpid coal black eyes. Truly he was well named Nyassa African Eyes, forever our boy, Rosko.